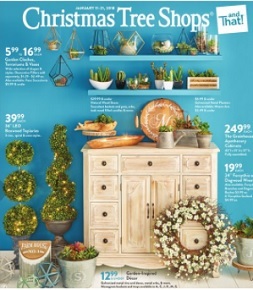 Featured offers in this Christmas Tree Shops flyer valid April 3 – April 14, 2019: $5.99 to $16.99 Garden Cloches, Terrariums & Vases; $39.99 36″ LED Boxwood Topiaries; $249.99 The Grainhouse Apothecary Cabinets; $19.99 24” Forsythia or Dogwood Wreaths; $12.99 & Under Garden-Inspired Décor; $1.99 Riesa Pastas & Emeril’s Sauces; $3.99 10′ String Lights; $6.99 12-lb Keep It Green Ice Melt; $1 Bath And Body Essentials; $1.99 to $3.99 The Grainhouse Ceramic Dinnerware; $7.99 & $9.99 The Grainhouse Cotton Stripe Tablecloths; $19.99 to $39.99 Wooden Wall Décor; $129.99 Ball Leg Consoles; $129.99 Ball Leg Ottomans; $179.99 Ball Frame Chairs; $19.99 & Under Baskets; $10.99 to $19.99 Accent Pillows; $3.99 Value-Sized Snack Bags; $2.99 & $3.99 Handpainted Valentine Wineglasses & Flutes; $12.99 Valentine Embellished Pillows and 72” Runners; and more. Find all deals and offers in the latest Christmas Tree Shops Weekly Ad for your local store. Promotions, discounts, rebates, coupons, specials, and the best sales for this week are available in the weekly ad circular for your store. iWeeklyAds.com is the essential website for your weekly shopping. Search circular deals and coupons by store, or category to quickly find the best sales on your weekly ad. If you are searching for the best offers and deals, then you are in the right place. iWeeklyAds is the web portal where we are trying to gather in a single place all major US retailers and groceries weekly ads and circulars, posting their latest offers, promo, coupons and deals. Also browse special Ads and Circular on major holiday sales days: January White sales, Memorial Day, Columbus Day, Valentines Day, Father’s Day, Easter sales, Veterans Day, Presidents Day, July 4th sales, Black Friday ads, Cyber Monday deals, Mother’s Day, Labor Day or Christmas sales.